A giant wind turbine in northern Germany — one of the world’s largest. However, the bigger they are, the more power generation you must replace when the wind fails to turn them. This is caused not only by a lack of wind: the strongest winds are useless. 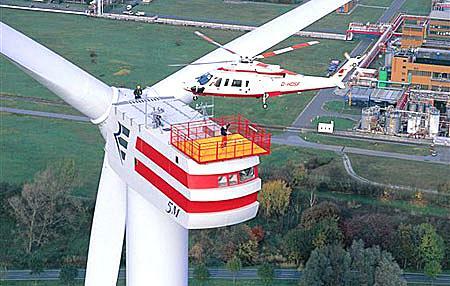 Because the turbines are destroyed operating in winds over about 45–80 mph (70–130 kph), the brakes go on or the blades furl themselves automatically. Free energy? There’s no such thing. These megoliths are expensive to build and maintain and they are ruinous when idle. But their Achilles heel is, without doubt, their inability to supply a community of any importance (is yours important?) without power cuts. They need backup generation available at a moment’s notice 24 hours a day, every day of the year, for when the wind fails to blow or blows too hard. Expensive is hardly an adequate word for this! You pay for two power stations but get the electricity from only one. Nandor Tanczos, pot-smoking ex-Green MP, said insensitively last Monday that the “real destruction” from coal mining is “the deaths it causes outside the mines” (though he provides no evidence for us to believe it). What is the Green Party’s answer to the incompetence of wind power to prevent those deaths? This account is the more arresting for being written by a man clearly well-informed about and sensitive towards environmental considerations. If even he is questioning the wisdom — financial and environmental — of wind turbines, we should take notice. It is also instructive that this is the experience of the largest and strongest economy in Europe; if they cannot solve the problems even with their enormous resources in both research and manufacturing, then New Zealand cannot. You’ll read below how German consumers are grossly overcharged for the generation AND DISTRIBUTION of electricity — surely the only financial reason these behemoths can survive. If you want energy now, don’t rely on wind generation. I’ve said before that the only sensible use for wind power is for digging a big hole you don’t need yet. A new dark age for Germany?